It’s hot outside. Now that the heavy machinery of late-spring squall lines and swirling, tornadic motion produced by cold fronts sliding down from the Rockies to the northwest of us and roaring over the sky above the plains of Oklahoma has given way to the massive bulk of Hurricane Bill coming up out of the gulf, lumbering his way up over Texas — and though the Cimarron River near where I live is, here in late June, still fat from the record-setting rainfall of this past May — the air is humming with the lethargy of the moment before creation, waiting. The air is saying: comes this way a big storm. The air is saying: comes this way the remnants of a hurricane from the sea to the south. As the first explorative raindrops fall scattershot on my back porch, as the hurricane begins crashing against the coast of Texas, its strength building, the barometric pressure here in central Oklahoma climbing so high I can barely think, barely breathe — Theodore Roethke and all he’s meant to me comes back to mind. Snail, snail, glister me forward, / Bird, soft-sigh me home, / Worm, be with me. / This is my hard time. At the time of Roethke’s death in 1963 from a heart attack in a swimming pool on Bainbridge Island, which lies directly across Puget Sound from Seattle, he was regarded as one the preeminent living American poets, rivaled only in his generation by Robert Lowell. If you take a look at his place on the shelf of any large university library, you’ll find a hefty swath of scholarship on him dating from the late-’50s well into the early-’70s. In the early-’80s, though, scholarly work on Roethke dried up. Though his poetry was much lauded during the final decade of his life — he won the Pulitzer Prize in 1954 for The Waking, and received both the Bollingen and the National Book Award for 1959’s Words for the Wind — he regarded himself principally as a failure. In comparison to other of his contemporaries whose places in literary history have for the most part solidified, Elizabeth Bishop being but one example, his star has fallen. This despite winning another National Book Award posthumously for The Far Field, released two years after his death, despite nearly winning another for his Collected Poems the next year, and though his work was a tremendous influence on both Sylvia Plath and, as poet August Kleinzahler pointed out recently in the London Review of Books, John Berryman. In an interview with The Paris Review in 1976, at what was probably the peak of Roethke’s posthumous fame, the poet James Dickey referred to him as “the greatest American poet,” even going so far as to say Walt Whitman was “no competition” for him. Yet in the years since, Roethke’s work has rusted into oblivion, largely unread and unremarked-upon. The reasons for this are twofold. The first and easiest to elucidate is the criticism he suffered most from in his own lifetime: that his lesser work was too derivative of other poets, namely W.B. Yeats. It’s a criticism that he to some degree openly courted. For Roethke, influence was something to be transcended by reveling in it. The poem of another could not be known, could not be truly inhabited, unless he had written it in his own hand. And, in the notebooks in the archives at the University of Washington where his papers are stored, one can find poem after poem by a multitude of writers that he felt compelled to write out, longhand. Like the novelist Jonathan Lethem, Roethke regarded influence not as an anxiety but an ecstasy. It is true that, in his lesser works, his poetry suffers from being too dependent on that of his predecessors, but what poet’s work, even a great poet’s, fails to show some influence of other poets at some time or another? On the other hand, in Roethke’s best work, using what is arguably the most rhythmic, musical poetic line of his generation, he reaches for a oneness with nature and an apocalypse of spirit that few American poets of any era have reached. Which leads me to the next, more ethereal reason for Roethke’s decline in prominence. It’s one that I can’t emphasize enough: there has, for some time, been no place in the American literary mainstream for the religious, God-addled, apocalyptic consciousness of someone like Roethke. It’s as if the entire critical apparatus used to deal with a writer whose work grapples explicitly, aggressively with the Eternal has disappeared. Aside from Annie Dillard, whose work (both creative and critical) certainly soars with a transcendentalist, eternity-haunted uplift, there have been few recent writers willing to wade out into the mouth of the river and seek the God-who-dwells-in-the-depths. Lord, hear me out, and hear me out this day: / From me to Thee’s a long and terrible way? The chronology of what follows is confusing but unimportant. Follow if you can: So far, at age 21, I had had only one relationship that could really be called mutual, and which was abruptly ended when the sarcastic, funny girl from Texas I was dating suddenly saw me as the gaping pit of need that I was, and was willing to tell me so. I was a sinkhole. Immediately before her, and immediately after her, followed two relationships with women who seemed as damaged as I thought I was, and their rejections — in both cases exceedingly gentle, and all the more confusing as a result — left me, one cool, still night that year thinking seriously that my best plan of action might be to smuggle a cement block onto the Bainbridge Ferry under the cover of darkness and, my arms wrapped around it, leap off into the depths of Puget Sound. Fortunately, a friend found me that night — no fatal ferry ride would be forthcoming. I was a sad sack with an iron conviction that I was totally fucked. And then Roethke came into my hands the next December. Not even the soot dances. and it was a revelation for me. For the first time in the entire two years I’d been living in Seattle, I felt like I could breathe. Suddenly each breath brought its proper draught of air into my lungs — and this, from a pair of stanzas about the spirit’s failure to move! I was raw, and could see those raw cities, could feel those gulls wheeling, screeching over the singular wreckage of my young and aching heart. A tornado had reached down into the grinding tropical depression my life had become: I knew I’d found someone who could help me through my hard time. He was born in Saginaw, Mich,, nowhere-place. I was born in Talihina, Okla., an even more nowhere-place. His father was proud, demanding, and Germanically rigid in his habits and beliefs; so was mine. My father was far removed, 2,000 miles away in Oklahoma, fierce in his religious beliefs, and displeased with the thoughtless — or so he thought — pattern of my life. On a misbegotten visit in the spring of my first year in Seattle, sitting in the sun outside a steel-and-grease hamburger joint near the Fremont Bridge that I’d thought might cheer us both up, through a voice choked by anger and sadness, my father let me know just how disappointed he was at what he viewed as my losing my faith — his faith. For weeks afterward, I walked the streets of Seattle in a haze, lost in the fog of my father’s wrath, and God’s distance, the both of which felt inextricably linked. Roethke had moved to Seattle from his part of the middle of the country, in Michigan. I had moved there from mine, in Oklahoma. Roethke’s father died when he was 15; he spent the last part of his life elegizing his longing for both his long-dead earthly father and for oneness with his supernatural one. With my own father far removed and a perpetual image of his saddened, outraged, grimacing mouth in my mind, I sought surrogate fathers elsewhere, everywhere I could. My undergraduate advisor became a father to me; my therapist, a mountainous man named Bil, became another. These men were not always willing to play the role I’d given them, and who could blame them? They hadn’t signed up to play daddy for a gaping young man barely in his 20s, too often drunk and drowning under the weight of his own sadness, not for this youth made of need, so hungry for guidance, for a warm hand to settle on his shoulder and tell him he was acceptable. Remembering the version of myself who sat in those chairs in those offices across from those men, under the fading gray light of so many Seattle afternoons, it’s almost too embarrassing to contemplate. Love me! I was saying. Tell me I am a man. The sky here in Oklahoma, on this cloud-washed afternoon, could be a Seattle sky, if it weren’t for the stifling humidity beneath it, here on the ground. Up above, gray fades into gray, white to off-white, cirrus strands interrupted by cumulus clouds stretched out like clumps of torn, dirty cotton. The slow, convoluted motions of the front coming up from the gulf. These clouds bring no wind, none of the thunderous clatter of the fronts that rip down over the plains to the north — this storm is a sleepy monster, fascinated with its own languor. 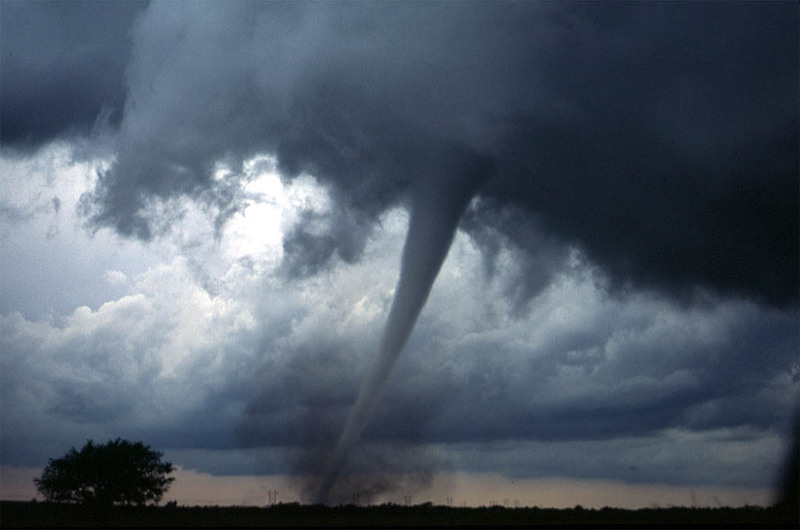 Here’s the real difference between tornadoes and hurricanes: the latter are infatuated with themselves, and take their sweet, destructive time, while the former reach down from the firmament with all the suddenness, anger, and fury of the Old Testament Yahweh, and may, if they feel like it — though they tear down all four walls of a house and rip apart every cowering, pleading-to-God inhabitant within — leave a glass of milk untouched, unshuddering, on a table with three legs. The right thing happens to the happy man. I hoped Roethke was right. But how to be happy? I wondered. Did the wrong thing, then, happen to the unhappy man? I was anything but happy. I felt crushed, spiritually homeless, geographically fenced off: a strand of barbed wire stretched between myself and the home I longed for. My first effort at writing about Roethke was an abortive one. My undergraduate advisor, a literature professor who’d first taught Roethke’s work as a graduate student at the University of Washington in the mid-’70s, back when Roethke’s poetry was still required reading, wanted me to deeply engage with the poems themselves, word-by-word, image-by-image, line-by-line. What I wanted to write about was the part of my self that reading Roethke had brought screaming onto the center stage of my inner life. And that, I thought somewhat petulantly, wasn’t to be found in between images, or by marking the stresses in the long, rhythmic free verse lines of Roethke’s “North American Sequence.” It’s not that I didn’t care about the language — in some ways I cared about little else, or at least thought I did. But couldn’t the poetry speak for itself? What was the point of analysis, I wondered, when I was dreaming of cement blocks on ferry rides, lonely as a lone cottonwood on a rise in a wheat field, trembling before the flashing teeth of an F5 twister reaching down out of a viper-green sky? I thought any analysis of Roethke’s poetry, the sounds of which I could hear more clearly than anything else in the storm that was my life at the time, would be murder to dissect. Roethke, fortunately, was not so put off by my eagerness, or by my need, or by misplaced desire for a new father. If anything, he and I were on the same wavelength — although his was the more expansive. Reading him, I found the world vaster than I had previously thought possible. and thus, he embodies one river, a river near his home, while sitting beside another, in the Pacific Northwest, which was something I badly needed to do as I sat reading in the sand of a Puget Sound beach, wanting to go home again, to the river where I grew up in southeastern Oklahoma, but being unable to. Reading Roethke was a way for me to go home again. Earlier I said it’s me taken me six years to write this essay. A long time for a mere 4,000 words to present themselves. I’ve given up time and time again, and it’s beyond me why or how I woke up a few days ago with my long-planned, longer-abandoned “Roethke essay” on my brain. For years I’ve wanted to write about Roethke; for years I’ve felt like I wasn’t ready yet. So why didn’t I just do it? There’s a curious thing that happens when you truly subsume a writer’s work, when his or her work becomes a necessary sacrament, a part of the spiritual fabric of your life. It’s strange. Of course, no one can write well about an author she hasn’t deeply read. On the other hand, the more time I spent with his work the less I could actually say. This is the central crux of trying to write creatively about any author who means much to you, whose work has become an integral piece of the architecture of your inner world, because the work of a writer truly absorbed becomes slippery in the mind, like God. The more time you spend with the writer, the more mysterious he or she becomes to you. You approach the work; at the same moment the work both approaches you and recedes into the distance. The more time I spent with Roethke’s poems the less I could say about them. As the work became less and less external to me, and more and more part of my inner self, there was no way I could bring to bear on it the detached eye my professor seemed to want. When something becomes one with the inner self it loses its ability to be explained — and this makes sense, because the self is the great occluding mystery of human existence. It’s a fundamentally religious attitude: the more we know, the better we know how little we can say. Bill’s fury has gone: the clouds have lifted, and yesterday, the summer solstice left the sun hanging in the western sky until long after nine o’clock. Summer’s here, the season of hot wind blowing dirty trash through the streets of downtown Stillwater, a wild yet elegant dance that perhaps Roethke, with his slag-heaps fuming “at the edge of raw cities” could appreciate, trash waltzing with trash, abandoned water bottles with grease-stained, dried out McDonald’s hamburger sacks in the wind, dusty cigarette butts glancing off beer cans scudding down the sidewalk, under a 96-degree sun. For the first time in a week, I feel truly at peace. The twisted caps of empty ink pens are chasing chewed up drinking straws in roughly concentric circles along the alleyway: all is right with the world. Ultimately, I realized I could find no father except my own. Something changed: the long depression gradually lifted. Part of this was because I fell in love with a woman who loved me despite my laughable melodrama, despite my real sense of worthlessness. Part of it was because I realized that I didn’t have to understand it all, or unpack it — and that was the most important part. I reconciled with my father, who found he could embrace who I was despite our fundamental disconnect on who God was; I was able to embrace who he was because, with the help of my therapist, I realized that my father was not God. Just because Roethke seemed to conflate the two in his poetry didn’t mean I had to in my life. I let my dad come down off the pedestal, and he was more than willing to return to the earth. We both felt pretty relieved by this. Suddenly I was stronger than I thought. I could leave suffering behind, no longer in need of heavy weather, and step out into the sun. All of the quotes in the above section I’ve gleaned from Straw for the Fire, a collection of excerpts from Roethke’s notebooks, which was edited by the poet David Wagoner, Roethke’s student and, later, colleague.